In Oakland, that emergency room is at Highland Hospital. 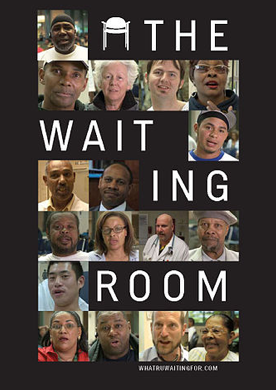 The documentary The Waiting Room takes us into the lobby and behind the scenes with the doctors, nurses, and patients who spend their hours there. KALW’s Holly Kernan spoke with director Pete Nicks. PETE NICKS: The waiting room at Highland if you come there on a Monday morning at about 7am – it is an incredibly loud and bustling environment that almost resembles the United Nations. It's a waiting room that serves a community of mostly uninsured patients who come from all over the world, and an incredibly diverse population both ethnically and also in terms of class. It can be loud because it is also the community's trauma center. It can be energized by these traumas that come in, whether it’s a gunshot victim or someone who's been in a car accident. Sometimes people get dropped off the front door of the hospital and the ED doctors have to roll them through the waiting room, so it’s a wild place. KERNAN: Yeah I thought I kind of knew how it worked because I report on this stuff. And yet watching the film was such an eye opener to me, and I agree it gives this picture of society and a society in crisis because a lot of these people have lost their jobs. NICKS: When we get the ring down from the paramedics that a trauma is on the way, literally 12 to 15 people stop whatever they're doing to focus on this one trauma. If several traumas roll in at the same time that is a huge impact on the rest of the waiting room. People with legitimately serious illnesses get bumped over at the trauma services. KERNAN: Pete tell us about that system cause it's heartbreaking that you've got a little kid in there who's got a fever that may look life threatening and yet she's just waiting. NICKS: What people don't understand when they're sitting in the waiting room is that this is a hospital that has a lot of other responsibilities beyond just taking care of them. And so when traumas came in, it creates a backlog in the waiting room and that whole system sort of connects and people are frustrated and they don't understand and they're angry. And what happened in public hospitals like Highland is that people are using the emergency waiting room as their primary care physician because they don't have insurance. They don't have anywhere else to go and that creates this sort of duality that’s also the trauma center – they have to deal with all the traumas and so we wanted to show that piece of the system. KERNAN: And it must be excruciating for the doctors and nurses that are dealing with this. NICKS: Well they're frustrated because they're trying really hard and it's been sort of described by some of the doctors because the hospital does kind of have a combat feel to it at times, that sort of Hamburger Hill that just when you've contained the enemy, a fresh wave comes over the hill and they work really hard to control the flow of patients in the hospital. And just when they're achieving a success something happens beyond their control, whether it’s a car accident, or in East Oakland you get a lot of gunshot wounds coming through there. And so those take a tremendous amount of resources away from dealing with and triaging people in the waiting room. KERNAN: One of the things that happened in 2010 is that you were really seeing the effects of the downturn. People who had a safety net, had health care, were suddenly turning to public hospitals as their last resorts. One gentleman said he'd been about a year without a job and he was there with his sick daughter. MAN (Clip from “The Waiting Room”): This is the first time I've went almost a year without a job. I'm used to having those benefits. You know that's how important a job is: to have somebody look at her as soon as possible. It just seems like a letdown, you depend on somebody to help you out when you not having a means to do it yourself the right way you know. So okay I am glad that there's a way to provide and help out but I wish there was a better way to do this. KERNAN: So they're referring to this high fever that this little girl has and her father is so frustrated beach he feels the weight of his daughters really escalating sit and yet he doesn't have health care anymore and he was saying that he felt guilty about it. NICKS: There is a sense of a loss of control in our health care system, that if you're in a plan where you understand the pieces there's a regularity of care and there aren't many surprises, that there's less to be concerned about at a place like Highland. It's not the quality of care, it's that unpredictability factor and that loss of control that I think patients sense that they know that when they're going to the waiting room, it’s a day long affair and they have to sort of mentally prepare themselves. NICKS: That's right, that's right. And as a parent it's an incredibly frustrating and fearful experience and I think there's a sense of people feeling down on themselves and they blame themselves. You especially saw that in this particular father as he was sort of watching helplessly as the nurses were caring for his daughter. He knew that he didn't know what was going to happen and there was that fear of what was gonna happen. KERNAN: So here's the thing that he doesn't see, that we see in your film, “The Waiting Room,” which is that the doctors have to prioritize people coming in on ambulances which includes some of these chronic cases that are sort of clogging the system – or that’s what it looks like. Chronic drug and alcohol abusers are coming in multiple times and get priority beds. So here is a little bit of that from this film the waiting room about Highland Hospital. DOCTOR: So this is our gentleman that came in found down apparently doesn't take his medicines that would help him stay out of the hospital he comes in… looking back he's come in a dozen times this year: August, July, June, June, May, May, May, March, March, February, February, February, February, February. Alcohol levels positive as well as amphetamines and cocaine… He's basically been denied by his Pastor Boswell board and care. I've admitted him for increased work on breathing but it’s actually more of a social issue. We never know the right answer on this one. I have to admit people in the hospital and keep them overnight just as much for their social condition as for their medical ones. It's not ideal but we're a public hospital. We're the safety net of society and the institution of last resort for so many people. NICKS: And this is one of the big realities of public medicine in America is that public hospitals, because they cannot turn anyone away – they have to deal with the most systemic and intractable problems of our society: poverty, homelessness, drug addiction, violence… And they're trying to juggle all that with this reality, this colliding economic reality where people are coming in for their primary care. And so these are very tough choices to make, and if people sitting in the waiting rooms sort of understood this and saw people like this character here who's a drug addict – they call them “frequent flyers” and these are people that they known by name (these are people that have a long history and relationship with the hospital and they can't turn them away) – someone who is coming in, who is doing everything right, taking care of their kids, just got laid off their jobs has to sit and wait for 10 hours because of this guy who has a drug problem… That's a kind of tension and a lot of that happens behind the scenes but it's one of the things that I think as a society we're struggling with, this question of how do we care for the people who are most in need. And so all this kind of comes together in a place like Highland. KERNAN: And that's what was so revealing about your film “The Waiting Room,” was to be able to see this whole system in its entirety from both sides, and it seems like if they had known in the waiting room there would be a revolt on your hands. NICKS: Absolutely. And I think part of the anger that bubbles up in the waiting room is not knowing what's going on. It seems like a big hospital. It seems like you guys have a lot of doctors running around. What going on? KERNAN: And I've got a bullet in my leg. NICKS: Right, and I think that's another thing like that character leading we heard earlier – he had a bullet in him and it's a sort of run-of-the-mill kind of thing. And that’s the other story of this community that is really hard for people to understand, is the things that we would imagine our traumatic events from this community are fairly typical. And so they're dealing with them on a fairly regular basis, as is the hospital. DeVelo, a character in the film, is sort of the classic archetype in many ways. This is a guy that does still have his job, but is feeling the pressure from two ends: from the economy and from his medical situation. A lot of times these things are so intertwined that if you pull on one, there goes the other. And with LeJuan, it’s connected to his job: He lays carpet, he wants to find out what’s going on with him. He can go into the waiting room and sit there for several hours, to be told, “Well, there’s not much we can do for you. We can give you some pain medication. If you want to go to the clinic it’s a several month-long wait.” And so that’s very frustrating. One of the things that I love about DeVelo and one of the things that attracted me to wanting to make this film was despite really difficult situations, the people that I met had this sort of optimism and this spirit about them that was really remarkable, that I think a lot of us would be pissed off and depressed, throw in the towel. But I think what it is, is this is a way of life. The issues that the community that relies on Highland are going through are issues that they have been going through for generations. And the community has a really deep relationship with Highland. And so there’s this sort of respect and sense between the community and the caregivers that’s really striking. And I think DeVelo – he didn’t yell at anybody, he was clearly frustrated, but he knew… He has a sense that they’re doing the best that they can do, that there’s a systemic issue behind it all that even the hospital doesn’t have control over. And I think that’s something that intuitively the community knows because we did see this banter between the patients and the doctors. You think, “If I was in that situation, if it was going to take three months to talk to someone about my back pain, I’d be pretty angry.” So that was something that we were struck by. KERNAN: One of the things that surprised me was the funding. I had assumed that if you didn’t have any money, that this as a public health system of last resort, that it wouldn’t cost you. But there’s this whole counter about paying for it, and some people can’t get the medicine, because they don’t have the money to pay for it. NICKS: I think that’s one of the things that may be a little surprising to people about the film. We did have a few scenes of people sort of meeting with what they call the financial counselor. KERNAN: That totally surprised me. NICKS: And that’s the moment of truth. You’ve done your time, you’ve done your wait, whether it’s three hours or 14 hours. You’ve seen the doctor, they’ve prescribed a medication or a course of action. And then you go sit down and find out what the bill’s going to be. Because contrary to what some people might think, public hospitals are not always free. And it’s basically a sliding scale, so they evaluate your financial situation: Are you employed? What’s your income? And they figure out whether you can pay. And if you have the means, then you’re going to get a bill. KERNAN: And how is this going to be changed? How is the public health system going to be affected by the health care reforms? KERNAN: What do you think, though? You know more than I do. Tigrinya to Spanish to Russian to Mandarin – these other hospitals don’t have this experience, cultural experience, to deal with a community as diverse as that. But the hospital is preparing for the chance that their patient population may change, because in 2014 those patients could have options to go elsewhere. It’s so complex that nobody quite knows what the impact will be. Are they going to gain patients? Are they going to lose patients? So that still remains to be seen. KERNAN: Your film “The Waiting Room” focuses mostly on the patient experience but we also get to meet some of the doctors and nurses. What’s it like from their side? They must be experiencing so much stress and strain as well. NICKS: If there’s a star in the film, I think it’s CJ – Cynthia Johnson – who is a certified nurse’s assistant, and she’s sort of the queen of the waiting room. And she is to some degree the conductor of the waiting room. When you come in, you see her and you get your vitals, you tell your story, the first bit of your story. And what we did was we spent time just sitting there with her, listening and observing these stories. And she has a remarkable ability to calm people down, to make them feel good, to put them in their place if they’re acting up. She’s a very unique individual, but there are others like that throughout the waiting room and in the emergency department. You’re dealing with people who are incredibly angry, who have lived very difficult lives, who are going through tremendous change in their lives, maybe because they just lost their job. And so they have to really talk to you as a person and not as a number, and I think she understands that. When we first me CJ, we knew that we wanted to follow her because we felt that she really embodied the spirit of the institution and this was just for me … Not only my wife works there, so I had a sort of intimate feel for the place. And I’m not going to say that every patient shares this sentiment – there’s a lot of frustration with the hospital on a variety of levels. But what we did see, and it was very clear, was that the remarkable commitment from the people, all the way down to the front lines, in the waiting room, and CJ really embodies that. It’s a relationship that this hospital has with this community. And she’s from this community, I mean, she was born at the hospital. She sees people that she knows, people that she’s never met before, people that speak other languages, and she’s able to communicate. And I think that’s part of what the film is about: that illness … there’s a vulnerability that we all have, it does bind us together as human beings, and that’s something that you see in the waiting room. And the waiting room as sort of a metaphor: Everyone’s waiting for something, whether it’s the birth of their first child, or to get a job, or whether it’s for their green card, or for a second chance in life. And she has this knack of connecting with people and making them feel better. And that’s part of health care, that little moment of sitting down with a nurse. And we really wanted to share that, because we think it’s important. We’re trying to communicate outward with our film that this health care thing that you hear about in the news and that everybody’s fighting about, that at a very fundamental level there’s an important relationship between communities and these hospitals that make a difference. KERNAN: And like you say, that’s kind of the hero of the story. If there’s a villain though, it seems to be a broken system. KERNAN: It’s a system that doesn’t seem to be working very well for people. NICKS: We didn’t know. We didn’t know how the hospital was going to come out in this. KERNAN: But I don’t think it’s the hospital so much. NICKS: No, but in terms of us telling the story of people, people are stuck in the waiting room. And they have to wait hours and hours for very basic care. And that does not seem, on its face, to make sense. But what we wanted to try to show was that there was -- even though we didn’t want to delve too deeply into the nitty gritty of it – that this was sort of beyond the hospital’s control, that they were struggling against forces that were beyond them, and we wanted to try to show that. Share your own health care story at The Waiting Room website. This interview originally aired November 7, 2011.